Since Instagram is the main platform where I share and talk about my calligraphy, I knew that I wanted to do a roundup post about a bunch of awesome calligraphers on there. A long, long time ago (as in one of the very first posts I ever made on this blog), I wrote a post about some calligraphers and hand-letterers on Instagram. Unfortunately, that post was a complete and utter fail since I only included 6 different accounts. Thus, I wanted to redo that same post topic in order to give it proper justice. 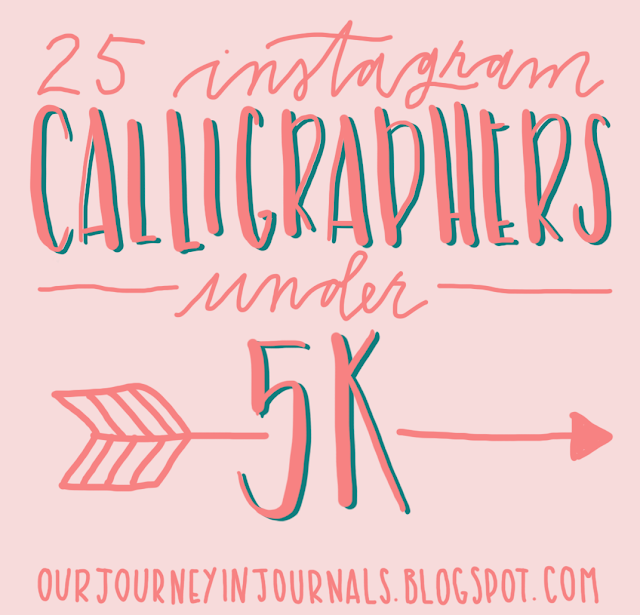 However, I'm adding a bit of a twist to this post: I'm only featuring 25 calligraphers that all have less than 5,000 followers (at the time of writing this). Since you probably already know the "big" accounts like @thePostman'sKnock or @Chrystalizabeth, I wanted to give some smaller - but still amazing - accounts the credit they deserve. So, I hope with this roundup (that is in no particular order, BTW), you'll be able to find a new favorite calligrapher on Instagram! Mychal of Boogie Peanut Design mainly does digital iPad lettering, but she also does some brush lettering. She also has a website where she sells worksheets, courses, custom Procreate brushes, and custom pieces. Honestly, this is one of my favorite calligraphy accounts on Instagram; I'm such a big fan of Dani's style. She does some works with brush markers, and as her username implies, she uses paint a lot - specifically watercolor. She also has an Etsy shop called Busy Bee Calligraphy where she sells wooden spoons with burned calligraphy. Kay K Designs utilizes quite a quirky style, and she mainly uses brush pens. Additionally, she has a website where she blogs and sells hand-lettered products. Chloe of @FloweringWords has a beautiful style, and she does a good mixture of pointed pen, brush marker, watercolor, and digital calligraphy. In addition to having awesome calligraphy skills, she also takes amazing pictures. Seriously. Just look through her feed. Jennifer, the woman behind this account, is a huge fan of brushes. The majority of her works are done with a water brush or with a real paintbrush. I feel like Haylee has quite a distinct style with her letters. She generally uses brush markers, but she also occasionally uses other mediums (such as embossing or iPad calligraphy). I'm a huge fan of Kolbie's style; I just really like the way she does cursive calligraphy. She usually uses paintbrushes with watercolor or ink or brush markers. Carlis does really cute hand-lettering (yes, cute), and she usually uses brush markers. Cali is mostly an iPad calligrapher, and she has a "wonky" style, if that makes any sense (just scroll through her feed and you'll understand what I mean). She also has an Etsy shop for hand-lettered products. Kelsey has a very artistic style (I mean, just look through her photos!) and mostly uses a mix of ink, watercolor, and brush markers. She also posts a lot of videos, which I think can be helpful to learn from. Kate usually uses water brushes with watercolor or brush markers, but she also sometimes does things like chalk or emobssing. In addition, she has an Etsy shop for calligraphy pieces. Lexie has only been lettering for a couple of months, but I still really like her work! She does brush lettering in a very quirky and distinct style. Miku posts about an equal mixture of digital lettering and brush lettering (either with water brushes + watercolor or with brush markers). She doesn't really have a distinct style, but she can do a wide variety of different calligraphy styles. I really like Adeline's account; there's just something about her calligraphy and her pictures that I really enjoy! She generally uses watercolor, ink, and brush markers. Day 23 of #letterbetterchallenge 🎉💕❤️ having so much fun this month + this quote is awesome! Sarah's calligraphy is not only beautiful, but her photography of said calligraphy is also gorgeous! Brush pens are her primary medium. As of right now, Krishia only has 22 posts, but you can already tell that she's really skilled. I'm also a big theme of her theme. She does about an equal mixture of digital calligraphy and traditional calligraphy (brush markers or "real" ink). Ashley uses a wide range of mediums, but whatever art tool she does use, it looks nice! She has an Etsy shop where she sells different hand-lettered pieces. Humairah uses brush markers for calligraphy, but she is also a skilled watercolor artist. She often incorporates watercolor flowers into her lettering works. Last night, I climbed into that needs-to-be-cleaned tub in a sad state. The temporary bliss from my recent Smoked Butterscotch Latte completely worn off. The resurfacing pain of not being chosen right there at the edge of my heart. Recently, I wasn’t picked. I wasn’t the first to be elected to serve in a position that I really felt qualified, and honestly, the best for. Not chosen. Second best. Just stopped being asked. Ouch. ⠀⠀⠀⠀⠀⠀⠀⠀⠀ So there I was in my few quiet moments alone. Sulking. Just Jesus and me. Well, and James. Yes, right there in that hot bath, James and the Giant Peach decided to make an entrance. I love how the Holy Spirit works. In that movie, you hear the spirited little boy say several times that his parents, who were sadly eaten by a giant rhinoceros at the beginning of the film, always told him to “look at it another way.” Smart people. Sounds like kingdom-thinking to me. So there I was, almost not ready to move on from my I-deserve-to-feel-this-way attitude, contemplating how I could look at this situation of being rejected in a different light. ⠀⠀⠀⠀⠀⠀⠀⠀⠀ Read the rest of how Jesus, James and a hot bath shifted my thinking. Now on the blog. Link in profile or at rawsugarwrites.com/blog. Would love to hear from you if there's a situation you're in that needs some kingdom perspective! Melissa makes lots of very pretty brush lettering (and photography), though she also occasionally does pointed pen. Her captions are generally quite inspirational, too. Additionally, she has a website which includes a blog and a shop. If you haven’t joined the Lettering League Facebook group, you’re missing out on some great sharing and learning and growing that’s been going on. The Lettering League aims to provide a place where the hand lettering and calligraphy community can share their work, learn from one another, practice, improve, and grow. In the spirit of learning and growing, this week's challenge is to share your most useful lettering tips, tricks, and resources. Make sure to post your photos on Instagram with the hashtags #LetteringLeague and #LLTips so I can repost them to the @LettteringLeague page. Crystal posts a mix of digital calligraphy and brush lettering, and she's one of the main people behind Lettering League. She also has a website for lettering and graphic design work. Jules's primary medium is ink (done with a water brush), and she recently started a series about daily good news (which I wholly appreciate after this inauguration). She also has an Etsy shop for lettering. Asia does beautiful watercolor and ink brush calligraphy (plus some brush marker stuff). She also has an Etsy shop for hand-lettered shirts. Monica usually uses ink and water brushes. I'm such a big fan of her work, and it's actually amazing to see her progress (with both her calligraphy and photography skills) when looking through her account. Emily doesn't post that often, but the few times she does, I usually like it! She usually does brush lettering with watercolor. Yup, this is my Instagram for Our Journey in Journals! I do a mix of digital calligraphy and brush lettering with brush markers. I also have a blog as you probably know (since you're on it right now lol). I hope you enjoyed that roundup of some underrated calligraphers! Yes, followers are not everything, but I hope that these people (who all have under 5000 right now) get the recognition they deserve. Who's your favorite calligrapher on Instagram? Tell me in a comment down below!